Last Thursday, de Merkplaats® and CC Proof® visited the Engineering programme (formerly Product Design) at the Amsterdam University of Applied Sciences (AUAS) to give a guest lecture expanding students’ knowledge of intellectual property rights. The AUAS students had been lobbying their university for some time to teach them more about how their creations could be legally protected. Thursday afternoon, their wish was met. In a 90-minute guest lecture, the designers-to-be were brought up to speed on such subjects as copyright and trademark law. 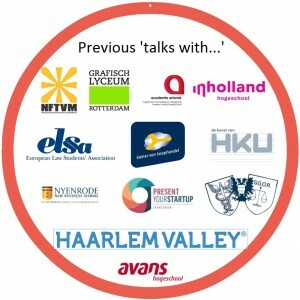 Thursday’s guest lecture was given by Alphons Geerlings, LLM, LLM and Sam van den Berg and was entitled ‘Talks With’. This refers to the fact that the Merkplaats® and CCProof® lectures are not intended to be monologues, but to engender discussion. They are meant to elicit conversations with students in which they can ask questions and display any knowledge they have already acquired about intellectual property rights. The Doppers®, which students could earn during the lecture by answering questions correctly, were a success. how a designer could “apply” for copyright. No formal procedure is required for copyright to exist: it is the result of having created something which can be perceived by the sensory system. This proved to be a true eye-opener for the students, some of whom already had promising ideas and great designs. Examples from practice were used in the lecture to explain that communicating the legal protection of your work in itself comprises a major part of such protection. All in all, it was a successful afternoon, with students leaving with a wealth of fresh knowledge and information.